On March 29, Lyft – a leading US ride-hailing company – went public on the Nasdaq. 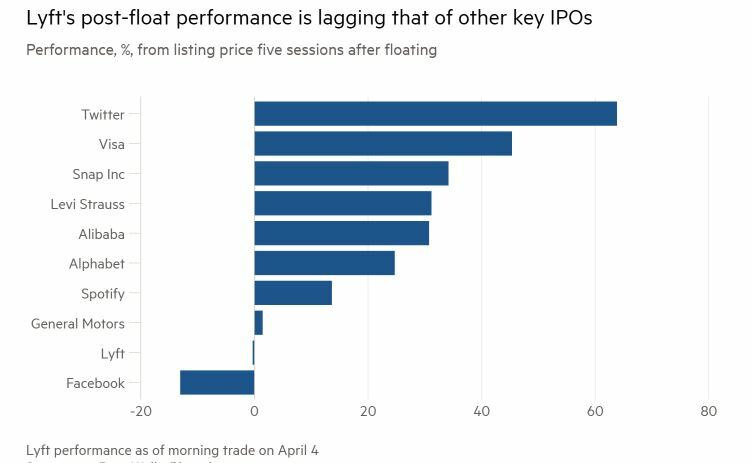 Its IPO price settled at the top end of the pricing range, with shares at $72 a piece valuing the company at nearly $24bn. The offering ranked as the largest listing to take place in the technological sector in the last two years. The reasons behind the transaction are mainly of a financial kind. Proceeds will be used to enhance Lyft’s capital structure, increase capitalization and improve its financial flexibility, while also grantingthe company and its shareholders an access to public equity markets. Founded in 2012 by Logan Green and John Zimmer and headquartered in San Francisco, Lyft is nowadays one of the largest and fastest growing multimodal transportation networks in North America, accounting for 4,800 employees. Since the beginning of its activities, the company has turned into one of the major spokesmen of a revolutionary movement aimed at facilitating transportation. With the launch of its app, it established a continuously evolving peer-to-peer marketplace for on-demand ridesharing that bets on a behavioral shift away from car ownership to Transportation as a Service – TaaS – solutions. The platform matches drivers and passengers through the app, which handles everything from the initial ride request to the final automatized payment. It covers 300 markets across the US and Canada,each with its own user network, while also adjusting to the specific features of each market in real-time. In fact, as of December 2018, Lyft holds 39% of the US ridesharing market, up 17% if compared to data from December 2016. Moreover, with 18.6m active riders and 1.1m drivers as of 2018 year-end, the company can rely on one of the largest transportation networks across the US and Canada. The network finds itself in a strongly expansionary phase as active riders keep on growing (+47% 4Q18 on 4Q17). Lyft also providestailor-made transportation solutions through additional offerings like bikes, scooters and public transportation add-ons. From a financial standpoint, bookings –which are defined by company’s management as the aggregate charges for rides on the platform – represent both the amount from which Lyft extracts revenues and a metric to capture service utility. 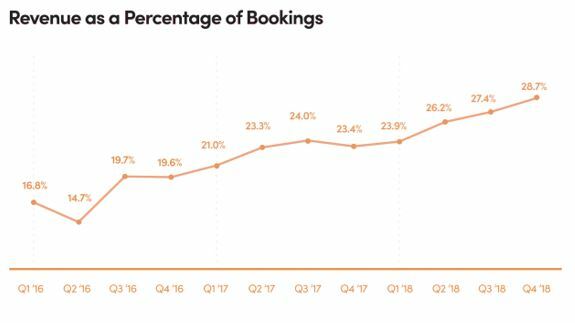 Specifically, bookings went from $1.9bn in 2016 to $8.1bn in 2018 (CAGR +106%). 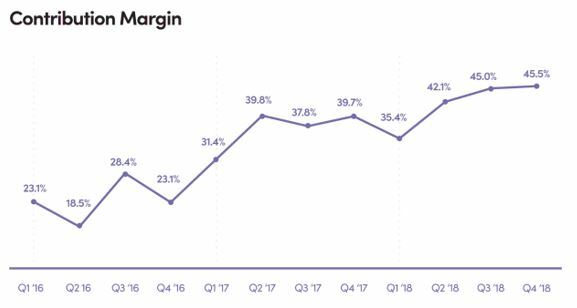 On the other hand, the quarterly evolution of revenues as a % of bookings and of the contribution margin – main measures of operating performance – are represented in the following graphs. In spite of the positive trends highlighted below, Lyft’s financial statement also reports a heavy cost burden, with total operating costs almost doubling YoY. These are mainly related to the company’s need to grow its rider base, a critical issue to improve operating performance. As a consequence, Lyft reported increasing net losses for the whole 2016 to 2018 period, with 2018 being the worst year with a $911.3m loss. 2019 and 2020 may have further losses in store and investors are likely to have to wait for the trend to revert until at least 2021. Besides internal growth, which has been fueled by a smart and flexible business model, Lyft has also resorted to targeted M&A activity in order to enhance specific business lines. In fact, throughout its history, the company completed two important acquisitions. In October 2018, it agreed to the purchase of Blue Vision Labs with the aim of exploiting robotics and AR expertise to enhance its autonomous vehicles offering. Three months prior, it also acquired the leading North American bike sharing company Motivate, in order to strengthen its bike sharing service. Lyft has emerged and grown into a key player in the revolution of the transportation industry, focusing on an on-demand ridesharing marketplace that is offered through a multimodal transportation network inthe United States and select cities in Canada. The company’s business, which rose from the need to find a solution to congestion problems in big cities like Los Angeles, has enabled more than 1 billion rides over its own network. Furthermore, Lyft is benefitting from increasing interest in the relatively new on-demand economy, as households find the service efficient, simple and more affordable than traditional transportation means. To put things into perspective, average annual expenditures in transportation account for $9,500 per family, which representsthe second biggest expenditure right after housing. The largest share of those expenses is incurred by car ownership. On the other hand, Lyft’s service allows individuals to reduce expenses by providing an affordable and convenient option. The business model of the company is based mainly upon their ridesharing offerings; however, it is growing to encompass a wider range of service offerings detailed below. Ridesharing: It is the core business of the company and connects drivers with riders. Riders are able to request different types of cars by selecting multiple preferences in factors like time, cost, number of seats, comfort and convenience. All of the solutions for both drivers and riders can be selected through two apps that Lyft has developed: the Lyft Driver App, which focuses on drivers by improving notifications of ride request, and the Lyft (Rider) App which enables riders to choose the possible paying plans, as it offers Subscription Plans and possible Ride Passes, which are promotions for select riders. The strength of this business line is to be found in the network’s scale, which enables Lyft to predict demand, optimize earning opportunities for drivers and convenience for riders. Bikes and Scooters: In order to address the needs of certain riders who are looking for shorter, cheaper, more active and – due to heavy traffic –more efficient trips, Lyft also offers a bikes and scooters sharing service. The latter could also work as a supplementary mode for the first and/or last mile of a multimodal trip with public transit. Bikes and Scooters can be found in select cities and position Lyft in a dominant place, as 74% of the 35 million US bike-sharing trips recorded in 2017 went through the systems of Motivate, a recently acquired bike-sharing company. Public Transit: This offering is based on the integration of third-party public transit data into the app and it is aimed at offering riders a robust view of transportation options. The inclusion of public transit into Lyft’s portfolio allows the company to provide a continuously connected offering, maximizing riders’ engagement with the platform. Autonomous Vehicles: Access to autonomous vehicles is offered through a number of strategic partnerships such as Lyft’s Open Platform partnership with Aptiv. The latter enabled the company to grant access to a fleet of autonomous vehicles on its Las Vegas platform. Besides the partnership, Lyft is also investing in the development of a proprietary fleet of AVs at its Level 5 Engineering Centre as it forecasts significant synergies with the network itself, allowing for high utilization opportunities and a low-cost reliable service. Lyft offers a wide range of special programs, including monthly ride credits for daily commutes, supplementing public transit by providing rides for the first and last leg of commute trips, late-night rides home and shuttle replacement rides. These are all designed to address the specific needs of customers, providing a personalized service. Additionally, organizations are offered centralized tools to help them manage overall transportation costs incurred for employees and customers—solutions of this kind are offered through Corporate Business Travel and Expensing for Business Travel options. Concierge services are also available, enabling organizations to request and schedule rides up to one week in advance. In terms of competitive advantage, Lyft benefits from a good and trusted relationship with both drivers and riders. The business is, in fact, a driver-centric one and is always aiming at improving experiences through tools that allow maximization of earnings, in-app tipping, flexible car rental programs, career coaches and 24/7 support. The company has also introduced its Driver Advisory Council in 2016, which functions as a middle man between drivers, whom it represents, and Lyft itself. Additionally, the significant network scale that has been created leads to optimal data analysis—an advantage that allows for personalized insights, increasing customer experience, optimization of automated best multimodal trips for riders, and the possibility to forecast the future demand in the 300 markets in which Lyft operates. The scaled network is also reinforced by the extensive net of partnerships, counting over 10,000 organizations, cities, and municipalities that have established good, long-term relations with the company. All the previous points add up to a strong brand that has been built throughout the years with effective marketing strategies that included creative content produced and published on platforms like YouTube, in collaboration with famous actors, athletes and singers with the goal to establish strong roots in popular culture. The Initial Public Offering started at 30.7m shares of Class A Common Stock, valued at a range between $62 and $68. This has been modified due to strong interest from investors, boosting offering prices to the top end of a range between $70 and $72. Number of shares offered also increased to 32.5m. The company would end up with two classes of common stock: Class A and Class B. Both classes share the same holding rights but differ in terms of voting and conversion rights. Each Class A share is entitled to one vote, while each Class B share is entitled to 20 votes and can be converted at any time into a Class A share. 48.59% of the voting power of the total outstanding common stock will be divided between Logan Green, co-founder, CEO and member of the board of directors and John Zimmer, co-founder, President and Vice-Chairman of the board. This puts them in a strong position, as they will be able to significantly influence decisions concerning the shareholderssuch as the election of the members of the board, amendments to the original certificate of incorporation, approval of future mergers, and major corporate transactions. Underwriters have also kept 1,625,000 shares of common stock offered in order to reserve them for directors, specific employees, and precise drivers that will be paid cash bonuses in order to take part in this directed share program. Lastly, the underwriting discount amounted to $1.98, taken from the offering price of $72.00. Lyft’s net proceeds from the IPO would be $2,275,650,000, meaning that underwriters would get $64,350,000 from the gross $2,340,000,000 obtained at $72 per share. The main purpose of the offering as stated by Lyft in the S-1 prospectus is to increase capitalization, financial flexibility, and enable access to public equity markets. Lyft, belonging to the growing family of Decacorns (tech companies valued above $10bn), incurred continuous revenue growth as well as net income losses similarly to many of its peers. Lyft doubled its revenue in 2018 to $2.2bn when compared to revenues of $1.1bn in 2017, however at a slower rate compared with growth from $343m in 2016. Decelerated revenue growth was accompanied by increasing net losses which grew from $687m in 2017 to $911m in 2018. The total accumulated deficit over the companies seven-year history amounted to $2.9bn. Due to extremely fast growth, the generated capital from the public offering will be used to accommodate losses and further expansion. The net proceeds from the offering will also be used for general corporate purposes, potential future acquisitions and investments in the company. Besides the main ride-hailing platform, Lyft expanded its asset-intensive network offering bicycle and scooter sharing. The company is also looking forward to investing in the growing sector of autonomous vehicle technology where many believe lays the future of transportation. However, it will surely face fierce competition from established companies such as Uber and Alphabet, which furthermore increases capital requirements. Lyft is also looking to expand its operations to foreign markets (as of now it is present only in the US and Canada). This requires capital in order to compete with Uber, which dominates markets outside the US, as well as to deal with regulators’ scrutiny which puts much pressure on ride-hailing apps and their compliance with local legal systems. The fierce rivalry for market dominance Uber and Lyft has resulted in somewhat of a price war where they compete for customers through subsidizing rides by giving out discounts and driving the price down. This is reflected not only in the two companies lagging profitability and increasing cash burn rate but also in the changing market dynamics, where for the time being Lyft holds 34% of the US market share and Uber the remaining 66%. Both companies were looking forward to going public at about the same time, however, Lyft turned out to be more eager to get to the market first. This can be explained by the recent bad press Uber was facing due to various cases of malpractice by the now ousted CEO Travis Kalanick and other internal problems. Lyft decided to take their chances and go public before its bigger brother, a move which made them the first ride-hailing company to IPO, thus outpacing Uber for the first time. The history of tech offerings points out to some advantages accruing to first to be public players – the IPOs of Yahoo and Netscape come to mind. Lyft priced its initial public offering at $72 per share, thus valuing the company at $24bn. The stock rose to a high of $88 on the first day of trading on Friday, March 29th; however, the stock continued to fall through Monday and closed at $70 per share on Tuesday before partially rebounding with stable day-on-day growth throughout this week. As the first IPO in the ride-sharing industry, Lyft proved how difficult it is to approach the matter quantitatively. There are no publicly traded companies that even compare to Lyft because it operates in a completely new industry, hence difficulties with valuation are inevitable. The uncertainty concerning the offering has immediately attracted the attention of short sellers, which is a rarity when it comes to newly listed companies. On Monday investors bet against Lyft by short selling 12.4m shares worth $856m (38% of shares being traded on the stock market). Snap, the parent company of social media app Snapchat, also faced unusually high levels of short seller attention early after its IPO, however amounting to only 20% of available shares (nearly half the short interest Lyft faces). The spike in shorting the stock suggests a lack of confidence in the company and a lower valuation by the public market. This might have also been caused by exits of longtime investors and activists who sold their shares prior to the IPO. Carl Ichan a long time backer of Lyft, sold his 2.7% stake in the company at some point between when Lyft first made its listing paperwork public and when the company set an initial price range for the offering. Lyft’s stock performance, however, is not unusual. Other tech giants such as Facebook traded below their opening price in the first week but later managed to recover. The ride-sharing firm’s first quarterly earnings report as a public company is getting closer, and only time will show if long investors will get their money back. 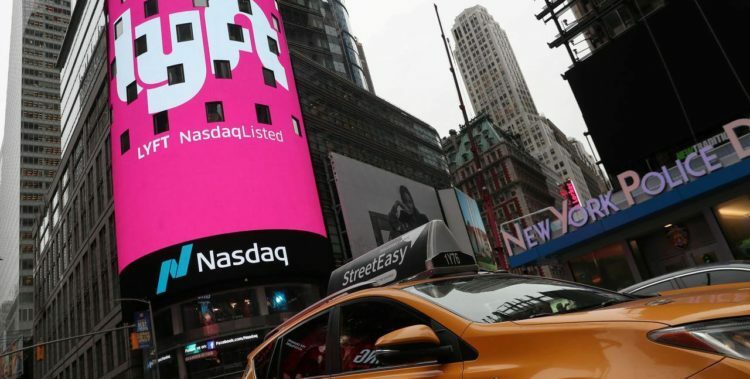 Lyft offered the shares of Class A common stock through a number of underwriters including smaller banks and J.P Morgan Securities LLC, Credit Suisse Securities and Jeffries LLC who acted as representatives. Stemming from the difficulty of the task, underwriters were paid a staggering $64m (a gross spread of 2.75%).